Are you brave enough? Then choose the game and try to be ready to take all the pumpkins. Yeah! Soon is Halloween and you will have to use the real cannon just to win the game. Use the mouse to play and set the best record here. Are you ready? Then go ahead! 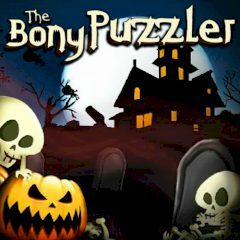 Here we wish you welcome and to get straight to the point, we are more than inpatient to present to you this game called The Bony Puzzler. So, it may be classified as a shoot game, but that’s not so important as this game is a lot more than every word used to classify it. So, it’s Halloween and pumpkins are to be picked up, so as you can already guess, it’s completely on you to perform the mission of this game the best way you possibly can. You will have to use the canon properly to achieve maximum result and be ready to enjoy the game.